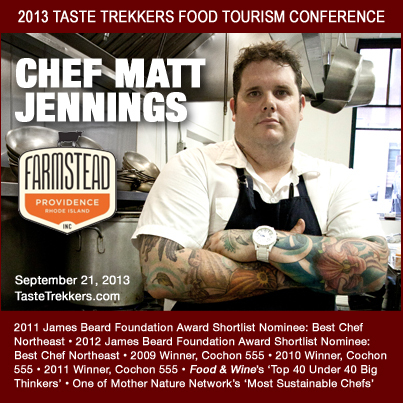 Farmstead Chef Matt Jennings will deliver the conference’s keynote. Yes, we can admit that Providence is not the best Spring Break destination, as Travel & Leisure reports. However, we do rank high in arguably more important measurements: #1 for hamburgers and #2 for both pizza and ice cream. As if you needed more than that, Providence also ranks #8 for ethnic food and #9 for micro-beers, among others. So, it should be no surprise that the Taste Trekkers Food Tourism Conference plans to come to Providence for its inaugural event in September 2013. Organized by Mystery Meet founder and Brown alum Seth Resler, the event, designed for people who plan their vacations around food, will bring together hundreds of chefs, farmers, food bloggers, travel writers, culinary students and others to enjoy a range of cuisines. Farmstead Chef Matt Jennings will deliver the conference’s keynote address, and the event will feature a cocktail reception, a tasting pavilion, a food truck court, and group dinners all around the city. In anticipation, they’ve launched a KickStarter campaign that will run through March 30 to fund the event. As with all KickStarter campaigns, if the project succeeds in reaching its funding goal, all backers’ credit cards will be charged. If the project falls short, no one is charged. So ante up everyone–they are giving away tickets, books, posters and more to contributors.